When Graeme Smith stepped down as South Africa's Twenty20 captain in August this year, he made a point of speaking about how he had softened as a person over time. When he was first made captain, Smith was cocksure, bordering on arrogant, but once he made it clear that he could stamp his authority, a real personality began to emerge. It was out in full force during the SuperSport Series match between the Cobras and the Lions at the Oppenheimer's private ground in Randjesfontein. Smith tiptoed on his heels because he was wearing spikes on the pavilion floor. He grinned as he imitated an injured duck and explained, "This floor is probably worth more than my house." That was the only thing that associated the burly left hander with the bird with webbed feet. He scored a magnificent double-hundred, 217 off 220 balls, in the Cobras' second innings to take the game away from the Lions. The Cobras were bowled out for 197 in their first stint at the crease, with all the Lions bowlers among the wickets. Cliffie Deacon led the pack with 3 for 41. On a pitch that is known to flatten as the match goes on, the Lions had perfect batting conditions to amass 416 for nine. None of the batsman managed a century in that total. Vaughn van Jaarsveld came closest with 87, followed by Zander de Bruyn's 76. Then came the magnificent Smith, who shared in a 333-run first-wicket partnership with Andrew Puttick (111). Wickets for the Lions came from unlikely sources, as Neil McKenzie (1/14) dismissed Smith, and Alviro Petersen (1/17) got rid of Puttick. JP Duminy added 69 and the Cobras posted 499 for five declared, setting the Lions a target of 281. Time ran out for a result, but with the Lions teetering on 55 for four, it looked as if the men from the Cape might get it to go their way. De Bruyn's 55 and van Jaarsveld's 44 saved the match for the hosts. That was the only draw of the weekend. Further north in Centurion, the Titans earned a nine wicket win over the Warriors. The Eastern Cape side appeared to have quite a hangover from twenty-over cricket and was skittled out for 89. Ethy Mbhalati took five for 33 while Morne Morkel (2/11) and CJ de Villiers (2/16) chipped in with two apiece. The Titans replied with 318 in their first innings. Heino Kuhn was left stranded on 94 and Jacques Rudolph made his bid for national honours clear with 72. Ashwell Prince led the Warriors line-up in their second knock. He scored 144, Jon-Jon Smuts made 78 and Arno Jacobs 71. Morne Morkel took four for 81 as the Warriors were bowled out for 380, leaving the Titans with 152 to win. Vice-captain Blake Snijman scored the bulk of the runs with an unbeaten 78 as the Titans wrapped up the match inside three days. In Kimberley, the newly-named Knights beat the Dolphins by 128 runs. Batting first, the Knights recovered from 76 for three to post 407. Morne van Wyk's 97 and Ryan Bailey's 70 were the two biggest contributions. The Dolphins were clearly at sea with the bat and were bowled out for 167 as Victor Mpitsang claimed 6 for 30. The Knights had a lead of 240 and declared their second innings closed on 140 for five, setting the Dolphins 381 to win. 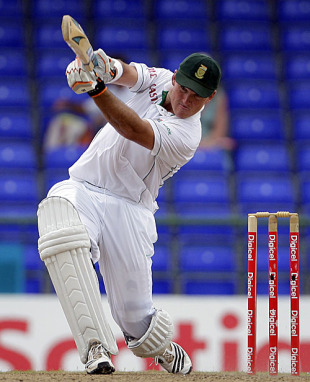 Dean Elgar scored 53 in the hosts' second knock. It was always going to be a tough ask for the men from Durban, and they were bowled out for 252. Ryan McLaren took 5 for 35 for the Knights and earned a call-up to the South African Twenty20 squad to replace the injured Albie Morkel. Batsman of the week: For growing his legendary status, Graeme Smith earns the award for his double hundred at almost run-a-ball for the Cobras. Bowler of the week: He bowled the Knights to victory and earned a national call up, albeit in a different format. Ryan McLaren for his five-wicket hall against the Dolphins gets this week's accolade.